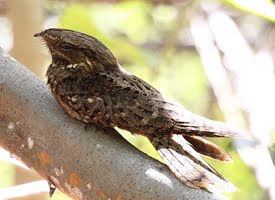 Listen at dusk and at night for the rolling, seemingly endless call of the Chuck-will’s-widow. For months, I have been searching for the sound I've been hearing at a distance. It's loud and its voice carries. Finally, I can put a name to the bird sings ALL night long so when he's on a roll, we have to keep our windows closed. 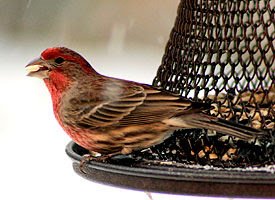 Also, flying around our bird feeder lately is this lovely little House Finch. I love its red plumage. And above all, the most amazing sight I've seen was a wild Mama Black ShoulderPeacockand her little peachicks. Earlier this week, she and her chicks were in the road near my house. I of course stopped and patiently waited as she and all her chicks crossed the road. Such an adorable sight. Especially the last one who straggled a bit behind and then hightailed it across the road.